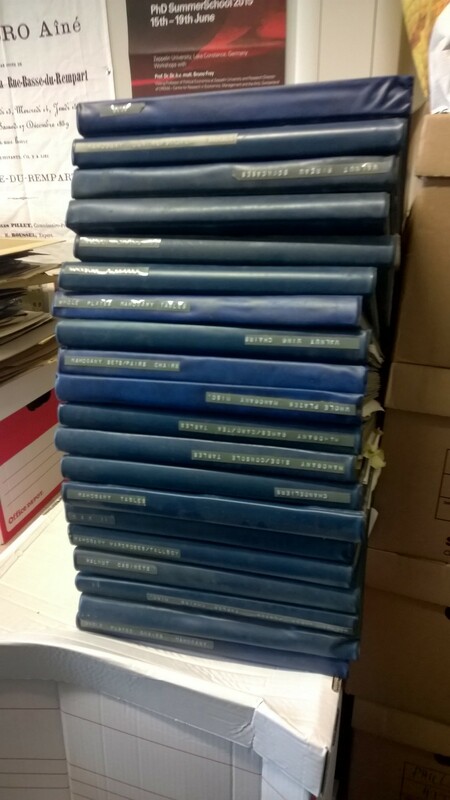 A couple of weeks ago our Phillips of Hitchin archive had some very significant additions. Thanks to the support and generosity of Simon Phillips and Thomas Lange at Ronald Phillips antiques, London, who very kindly sent, via their driver and courier, a very large number of archive boxes full of photographs, glass-plate negatives and associated marketing ephemera that Jerome Phillips, of the antique dealer firm of Phillips of Hitchin, had deposited with them in London. The new additions to the PoH archive include 15 large archive boxes of glass-plate negatives and 17 smaller archive boxes with similar contents. Both sets of glass-plate negatives appear to date from the 1920s-1950s and comprise PoH images of stock, plus glass-plate negatives of photographs of some other well-known antique dealer firms, including Hotspur, Ronald Lee, Stuart & Turner, Mallett and Frank Partridge. 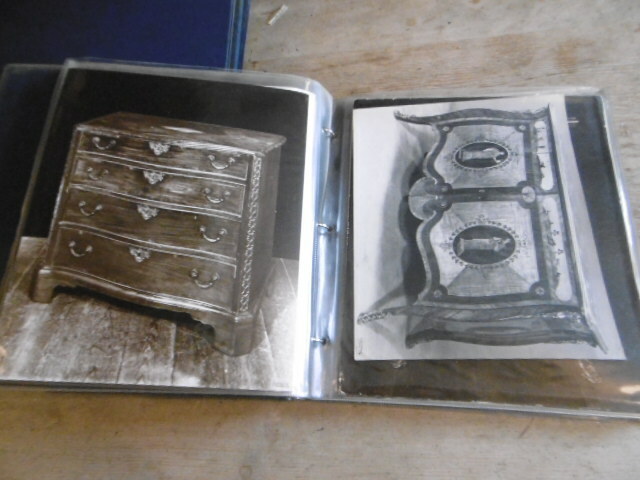 There are also some glass-plate negatives related to the antique furniture collector and author R.W. Symonds – perhaps for the publication of Masterpieces of English Furniture and Clocks (1940), which was republished in 1986 with an Introduction by Jerome Phillips. 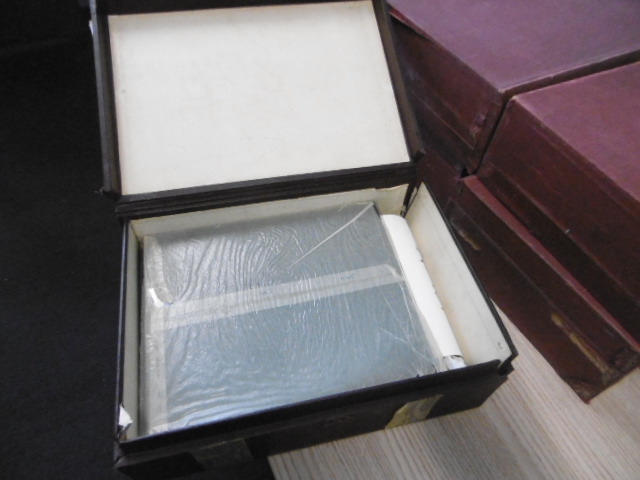 Boxes of glass-plate negatives, part of the PoH archive. University of Leeds. There is also one fascinating box of glass-plate negatives labelled ‘Arundel Paintings, 1912’ – which seems to relate to the famous Arundel Society (founded in 1849, for the dissemination of artworks via their reproductions). As well as these extensive sets of glass-plate negatives there are also 49 blue plastic albums packed with photographs of the antique furniture stock of PoH (dating c.1920s-1970s) organised by object type – ‘chairs’, ‘desks’, ‘tables’ etc; and a box of loose photographs dating from the very beginnings of PoH c.1900. PoH photograph albums. Phillips of Hitchin archives, Brotherton Library Special Collections, University of Leeds. 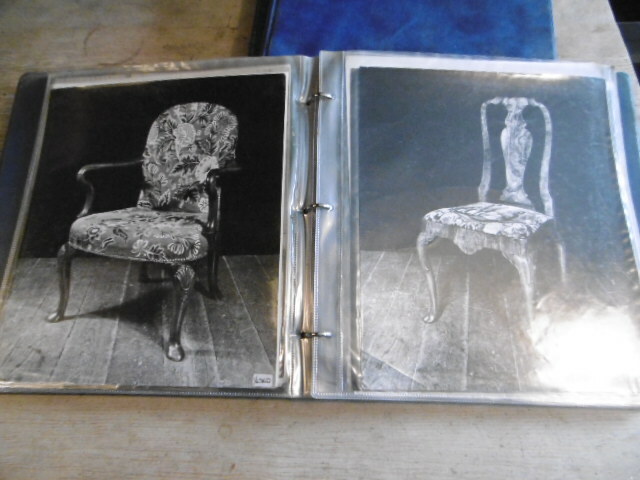 The photographs in the albums clearly illustrate the exceptionally high quality of antique furniture that passed through the hands of PoH – as the examples of the ‘chairs’ album of photographs, and the ‘commodes’ album demonstrate. PoH archive, ‘Commodes’ photo album. Phillips of Hitchin archive, Brotherton Library Special Collections, University of Leeds. PoH ‘Chairs’ photo album. Phillips of Hitchin archive, Brotherton Library Special Collections, University of Leeds. Amongst the photograph albums are two albums dedicated to the PoH stands at the world-famous Grosvenor House Antiques Fair; with photos of the PoH stands from the early 1950s up to the 1970s. 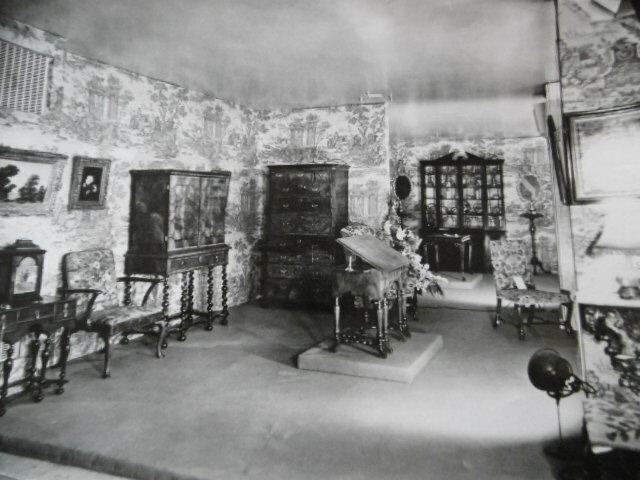 The photographs illustrate the changing methods of display adopted by PoH over the period – it’s interesting to note that PoH had also, from the earliest days of the business, produced reproduction wallpapers and textiles, and the PoH stands at the Grosvenor House Antiques Fair always appeared to have been decorated with PoH reproduction wallpapers. Here is the Phillips of Hitchin stand at Grosvenor House Antiques Fair in 1951. PoH stand at the Grosvenor House Antiques Fair, 1951. Phillips of Hitchin archive, Brotherton Library Special Collections, University of Leeds. PoH photo archive ‘ A rare old carved oak Vestry chair with marquetrie panel in back’, ‘circa 1650’. PoH archives, Brotherton Library Special Collections, University of Leeds. Perhaps the most fascinating photographs in the archive are those dating from the very earliest days of the PoH business, when the antique shop was then run by the founder of the firm Frederick W. Phillips, the grandfather of Jerome Phillips who so generously donated his family business archive to Leeds University. These early photographs, dating from c.1900-1910 are dominated by examples of oak, walnut and mahogany furniture, which was so fashionable in the early 20th century. 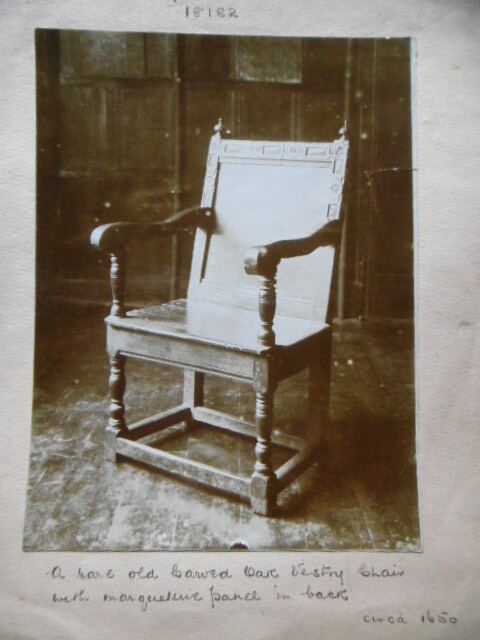 The ‘rare old carved oak Vestry chair..’ shown here, is inscribed on the back of the photograph in a contemporary hand, ‘this we have reproduced’ – a further demonstration of the breath and depth of the business of F.W. Phillips (as it was then) in the period around 1900. Indeed, as I’ve mentioned in previous blog posts on the antique dealer firm, F.W. Phillips was not only an ‘antique dealer’, but was also a complete home furnisher and interior decorator – he would also, if you so desired, build you an ‘ancient house’, (using recycled ancient materials) so fashionable in the period around the First World War. PoH archives, ‘a carved mahogany settee, c.1760, upholstered in crimson damask’. Phillips of Hitchin archive, Brotherton Library Special Collections, University of Leeds. 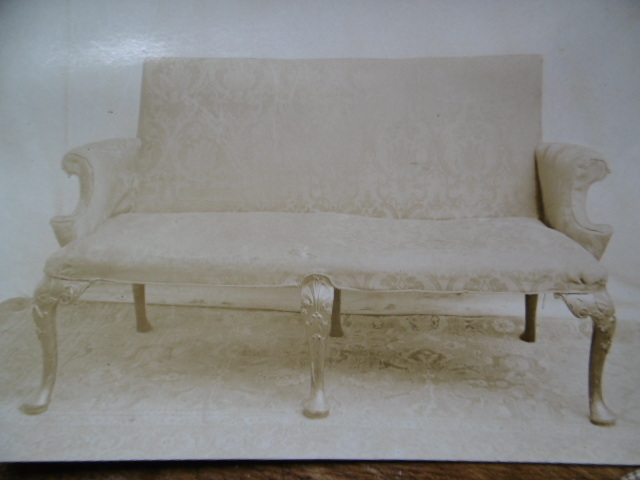 The back of the photograph has the inscription ‘carved mahogany settee…’ and also the price – ‘£95.0.0.’, which was quite a sum in c.1900. We are so grateful to Simon Phillips of Ronald Phillips Antiques for so generously paying for the transport of this large corpus of PoH archive material – they are a great addition to the PoH archive we already have at the University of Leeds and the addition of the photographs will allow us to match up the stock books that we already have with these fascinating images of the enormous variety of antiques that PoH sold over more than 100 years. My great uncle Basil Edwin Richardson (1853-1924) was a hop merchant who lived at Great Amwell, fairly near to Hitchin. His house was filled with antique furniture, much of which had to be replaced after a disastrous fire in 1900. Amongst his furniture was a fine tea table in the manner of Channon/Hintz/Roentgen, whose provenance I would like to extend. It is entirely possible that Basil Richardson was a customer of Phillips of Hitchin, and that their archives might throw some light on the matter. The table could have been acquired before or after 1900 (some items having been saved from the fire). Is it possible that you could give me an idea whether such preliminary research is possible, by you or by a paid researcher. (I live some way away in Dorset.) I would be most grateful for your advice.